Wondering exactly what is mid-century modern design? We're here to help you identify this recurring trend. Following the lifestyle and architecture of homes in the 1940s to 1970s, mid-century modern focuses on entertaining and open floor plans. Post World War II a reaction against the more traditional and overdone design aesthetic included new construction homes featuring living areas with separate bedroom wings and large windows and/or sliding doors. These architectural features aided in bringing the outdoors in. Mid-century modern doesn't mean minimalist! Color is key throughout geometric prints and use of primary colors. When you're thinking mid-century modern, think graphic patterns and quirky accents. Furniture low to the ground opens up spaces and makes doors and windows appear taller, opening your eye to more of the natural surroundings of your home. Don't forget that this trend is a resurgence of popular styles from the mid 1900's! 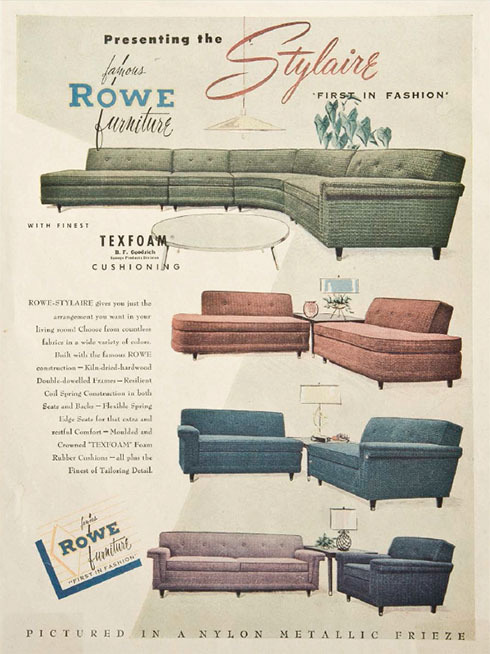 Check out these ads from Rowe Upholstery with their Stylaire Collection from then and now. Looking for this trend - or others? Stop into Belfort Furniture today and speak with our knowledgeable staff to see this and other trends on display in our showroom or available through catalogs! There are hundreds of room settings on display and the possibilities are endless when it comes to creating the perfect home that's just right for your style.